Measurements: 2.8 x 5.2 inches, or 71 x 133 mm. Back of card: Yellow-orange in color with a fine lattice/quilted pattern in thin red lines. May be inverted. Booklet included: Yes, 12 panes, 2.3 x 4.65 inches, or 59 x 119 mm. Text by Stuart R. Kaplan. Comments: Oswald Wirth was a 19th century Swiss occultist. He was a student of Stanislas de Guaita, an important French occultist. Wirth, aided by Guaita, based his tarot on the Tarot of Marseilles, incorporating modifications suggested by Eliphas Levi. This work appears to have been limited to the major arcana cards only. It was first published in 1889. The minor arcana cards are "newly created" in the style of Wirth. As for how new "new" may be, the deck itself is copyright 1976. - These notes adapted from those of Stuart R. Kaplan. 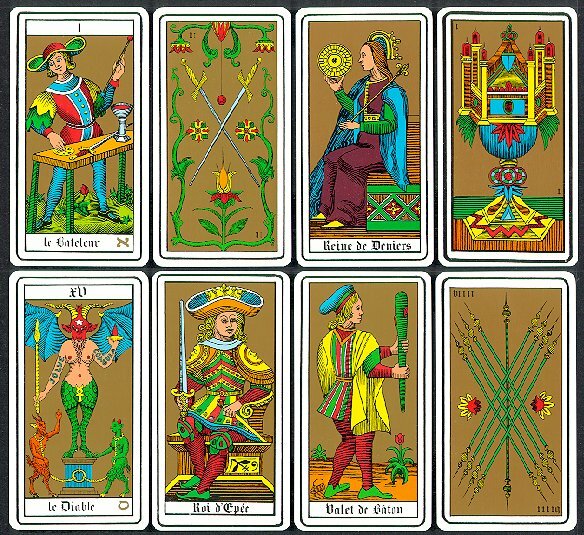 Tarot cards are commonly printed in a 10 x 8 grid, for a total of 80 cards. The two extra cards usually have the deck title & the artistic credits on them. In this deck, the two extra cards are blank, though they are printed on the back.